It’s a great pleasure to have Deborah A. Mills, cover illustrator of the Longing for Yount 2-volume series, as part of the official ChiZine Publications promotional tour for the release of the concluding volume: The Indigo Pheasant. Seeing as how my blog deals with the artsy as well as the bookish, I was delighted to find out I would be hosting Deborah’s discussion and explanations of her inspirations for the imagery used in both her cover designs! I’ve always been a firm believer in art having a purpose, and not just being done for the sake of art itself. Sure, many covers out there are lovely, but so many of them have no real purpose other than to just be pretty. Being a book cover designer myself, I absolutely love and appreciate Deborah’s designs and her very detailed reasoning behind them. Before we jump into her thoughts, let me introduce the dynamic duo behind the books! Deborah has been carving wood professionally since 1991. She studied wood sculpture with Lorrie Goulet at the Art Students League of New York and, while living in Norway, trained with master woodcarver Erik Fridstrøm at the Viking Ships Museum in Oslo. Daniel A. Rabuzzi, a former banker, studied folklore and mythology in college and graduate school, and keeps one foot firmly in the Other Realm. He earned his doctorate in 18th-century history, with a focus on family, gender and commerce in northern Europe. His first book, The Choir Boats, was published in 2009, and 2012 brought about the concluding novel, The Indigo Pheasant. He has also published a number is short stories, poems, and scholarly articles covering numerous topics. He is now an executive at a national workforce development organization in New York City, where he lives with his wife and soulmate, Deborah, along with the requisite two cats. Biographical information was acquired and spliced together from both Deborah’s and Daniel’s websites. 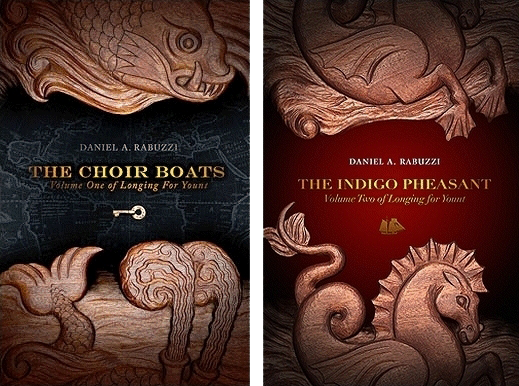 Find out more about The Choir Boats and The Indigo Pheasant by visiting their Goodreads pages. Daniel and I were terribly lucky to have ChiZine as his publishing house. 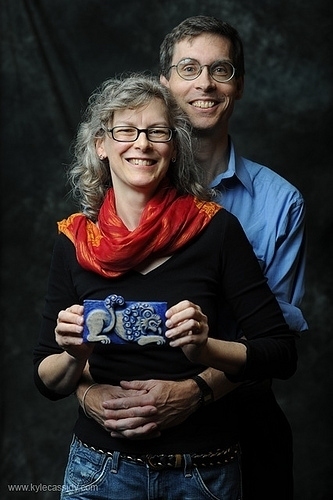 Sandra Kasturi and Brett Savory made a dream come true for both of us when they invited me to illustrate Daniel’s Longing for Yount historical fantasy series (not to mention that they also incorporated two of my sea beast carvings into the book covers!). theme that carries through both books. I added a foreboding crack to my version. For years, while Daniel honed drafts of The Choir Boats, we daydreamed and discussed what my illustrations might look like. Daniel created an enormous “Yount inspiration file” full of our sketches, photos, and pages torn from magazines, museum brochures and auction catalogs. 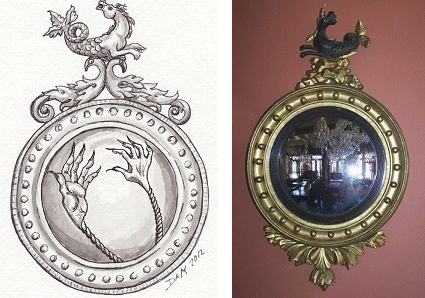 The file is full of the kinds of decorative objects that would have surrounded the characters in the books – much of it, of course, from the 18th and 19th centuries: sumptuous fabrics, carved furniture, mirrors and clock cases, porcelain tea ware and figurines, botanical prints, etc. When I suddenly had the actual job of creating illustrations to head each chapter, I knew I wanted to use everyday objects from the world of Daniel’s characters to hint at their personalities and some key sequences in the books. Personally, I am irked when illustrated characters in a book I’m reading don’t match the ones I see in my head, so I knew I didn’t want to show realistic “portraits.” Following our idea of using the material culture of the period, I searched Daniel’s manuscripts for objects associated with the different characters or scenes (like Sally’s locket, Barnabas’s sandalwood box, the dolphin door knocker on the McDoon front door and the sign outside the Piebald Swan coffee house, for example) and then did lots of further research on my own. I was thrilled to find a place to put a hippocamp mirror, having sketched many at museums and antique shows! I think it amplifies the creepiness of the “Conjure Hands” (another of Daniel’s extraordinarily visual literary creations). Meissen ware porcelain figurines of animals and birds were very popular in the early 1800s, so seemed a perfect way to depict some other favorite characters (Isaak the cat and Charicules the bird). mathematical formulae that are part of her magic. In The Choir Boats, my favorite character, Maggie, appears only in “interlude” chapters, which alternate with the main story-line’s chapters. I wanted the interlude illustrations to look different from the others, to signal the change in view point, but I didn’t have time to do something unique for each one (I thought). Then I had an “a-ha” moment, illuminated by my research into Igbo art and history (Maggie is an escaped slave, born in Maryland to Igbo captives). 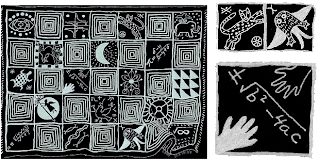 I realized I could mimic a traditional Igbo artform, the indigo-dyed ukara cloth, with blocks representing Maggie’s experiences throughout the story; once I’d scanned and digitized the image, I could cut out and enlarge segments that would refer to scenes in each interlude. 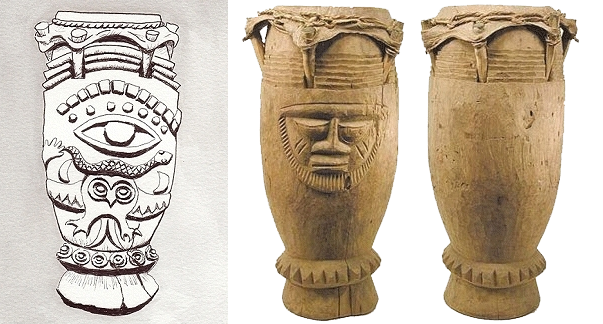 I’ve used a similar technique for the interlude segments of Daniel’s second and concluding novel, The Indigo Pheasant, carving one larger image into individual illustrations for each chapter head. 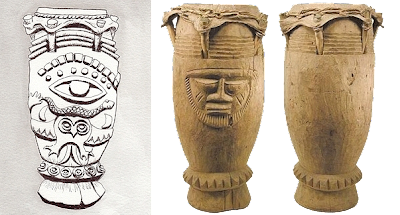 As a woodcarver, I could easily imagine an Igbo drum carved with moons, “the brown eye of wisdom,” warding hands and a threatening swallow-tailed owl, especially as my research showed how much meaning each of those symbols would convey in Igbo culture! As an inveterate museum junkie, I hope my illustrations will tempt readers to step a few feet beyond the familiar and maybe explore some of the cultures and artisans who produced these amazing objects that continue to inspire Daniel and me in our artwork together. Did Deborah inspire you to check out the Longing for Yount series? Get a taste by checking out the novel previews for both The Choir Boat and The Indigo Pheasant. And if a taste is not enough, both books are available on Amazon right now.